When is Rounders 2 Coming Out? Q: When is Rounders 2 Coming Out? A: There are two reasons why many people got into online poker - Chris Moneymaker and the movie "Rounders". Chris Moneymaker's win at the 2003 World Series of Poker, as well as the unbelievable popularity of the movie "Rounders", helped ignite the online poker boom in 2003-04. "Rounders", starring Matt Damon, John Malkovich and Edward Norton, helped to give poker a "cool factor" that sent many millions of people scrambling to the poker tables. 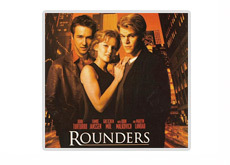 Given the success of the first "Rounders" movie, many people assumed that a sequel would eventually be on the way. Unfortunately for lovers of the movie, "things happened" (Matt Damon, Edward Norton became mega-stars, etc), and "Rounders 2" was never made, despite an incredible amount of pent-up demand. In recent months, things seem to have fallen into place for "Rounders 2" to finally be made. According to reports, the Weinstein Company has entered an alliance with Colony Capital and Quatar Holding to continue to develop some of the intellectual holdings in the Miramax library. This includes, according to reports, a "Rounders 2" sequel. According to reports, Matt Damon and Edward Norton would both be reprising their roles in the movie. In addition, Robert DeNiro is reportedly being eyed for the role of the "supervillian", which was played by John Malkovich ("Teddy KGB") in the first movie. These reports state that the movie would take place in Paris and Las Vegas. For fans of "Rounders 2", it appears as though the movie will finally get made. The main actors are on board, the writers are apparently on board and the owners of the "Rounders" property now seem to be on board as well. When might we see Mike McDermott and "Worm" back in action? It will likely take a few years yet, but the movie seems to be coming. April 18th, 2016 update: Will Rounders 2 ever get made? The movie has been "in development" for years now and there is no sign that it will get made anytime soon. August 3rd, 2016 update: Matt Damon recently revealed in an interview that he has had some preliminary discussions with the writers of the original "Rounders" move about possibly doing a sequel. According to Damon, the movie would look at how the likes of Mike McDermott and "Worm" would do in a poker world that is now populated by young players who have played millions of hands by the time that they are 21. April 2nd, 2017 update: According to one of the co-writers of Rounders, Brian Koppelman, Miramax continues to own the rights to "Rounders". Until Miramax decides to move ahead with the sequel, Koppelman says, the movie will continue to remain in limbo.